I always keep the freezer stocked with healthy make-ahead breakfasts for my 3-year-old. Things like peach baked oatmeal and raspberry muffins were totally a no-brainer, but one surprising breakfast my daughter loves is tofu scramble. In fact, she’ll choose it over all those sweet things and her favorite way to eat it is in the form of a wrap. Which is nice! Because wraps are even easier to store in the freezer and heat up. This is one of those recipes that’s really more of a template than instructions that need to be closely followed lest disaster ensue. Not into kale? Spinach or chard are good too–or leave out the greens altogether. I’ve made these with summer vegetables like zucchini and homemade sun-dried tomatoes, with hashbrowns and tempeh bacon, with chili powder and black beans… but these wraps are the only way my daughter will eat mushrooms, so I usually stick with this version. 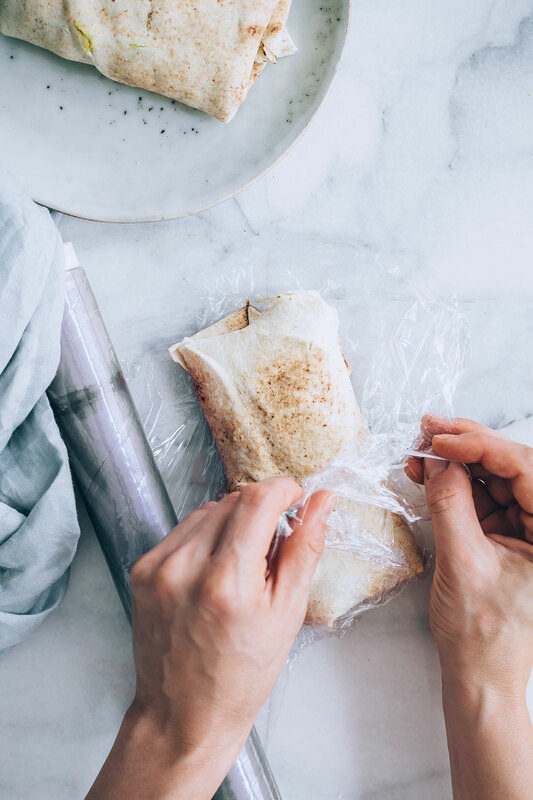 When it comes to freezer cooking, wraps are one of your easier options for both freezing and reheating. Because I tend to store things in the freezer for a month or two, I wrap the tofu scramble wraps in a layer of plastic wrap first, then in foil to help prevent freezer burn. Then, I add another layer of protection by popping them in a freezer bag. If you choose to reheat your tofu scramble wraps in the oven, your best bet is to let them thaw in the fridge for a day–or at least overnight–so they don’t need as much time heating up. But because we’re usually in a rush in the morning, I just use the microwave and breakfast is ready in 2 minutes. Boom! 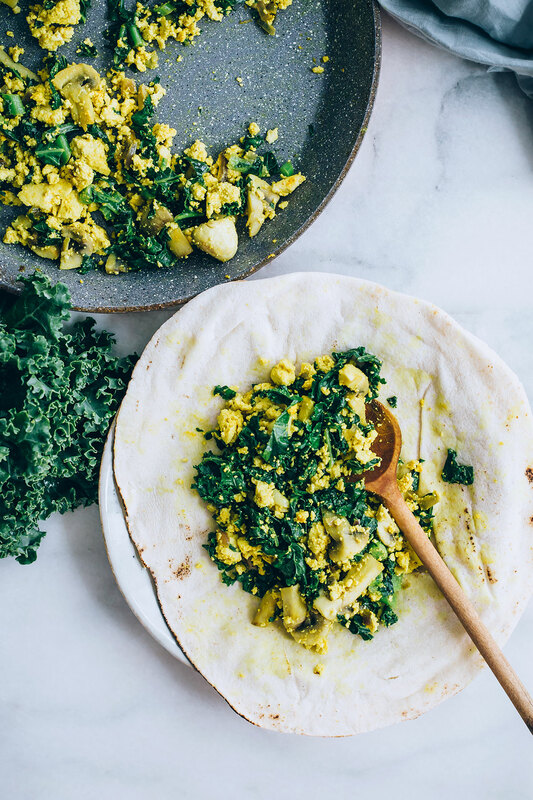 Customize these tofu scramble wraps with your favorite seasonal vegetables and seasonings. Crumble the tofu into a medium mixing bowl. Stir in the nutritional yeast, turmeric, and garlic powder. Heat the oil in a large skillet over medium heat. Add the shallot; cook for about 5 minutes or until it's softened, stirring occasionally. Add the mushrooms and cook about 5 minutes more, or until any liquid has cooked off and the mushrooms are just beginning to brown. Stir in the kale and tofu. Continue to cook, stirring often, until the kale has wilted a bit. Remove from heat and season with salt and pepper to taste. Divide the tofu mixture onto the tortillas and fold them like a burrito. To freeze, wrap tightly in a layer of plastic wrap and place the wraps in a freezer bag. If you plan on keeping these in the freezer for a while, you might want to wrap them in a layer of foil too. 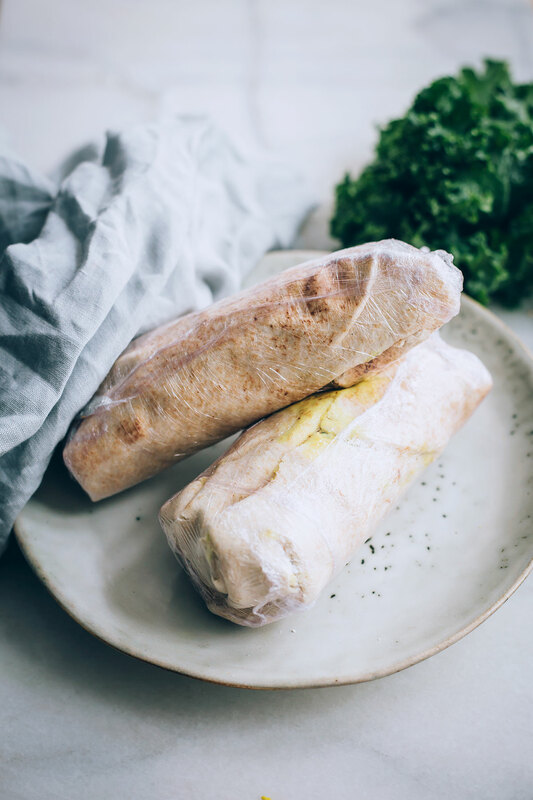 To reheat the wraps, remove the plastic and loosely wrap in a paper towel. Microwave for about 1 minute, flip the wrap over, and microwave again for a minute more. If the center is still cold, continue to microwave for 15 second intervals until the wrap is heated through. 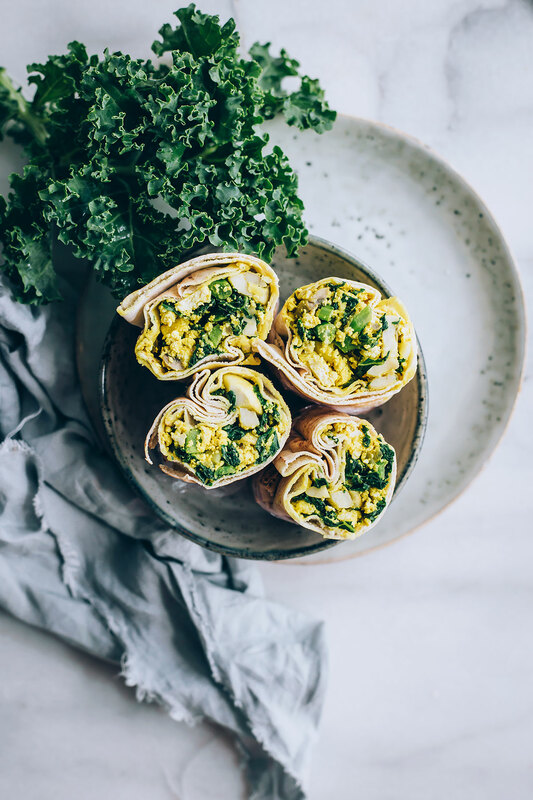 Medium tortillas are the perfect size for little hands or a light breakfast, but if you're making these for yourself and want something a bit bigger, go for the large, burrito-sized tortillas and make 4 wraps instead of 6.